We hadn’t spent much time on the beach since leaving the Philippines in April and both of us were looking forward to a little rest and relaxation on Turkey’s beautiful Mediterranean coast. Peak season on the coast had supposedly passed but after dodging crowds in Istanbul and struggling to find a hotel room in Cappadocia, we weren’t willing to take any chances. When deciding which part of the coast to visit, we focused on spots that are a bit off the beaten path. In Cappadocia we boarded an overnight bus for Fethiye and then hopped on a minibus to Faralya. As we drove through Fethiye’s tourist area, we looked out at the nightmare that could have been: t-shirt shops, tour operators, and all-you-can-eat buffet restaurants lined the streets. We were only a few water parks away from 1980s era Wisconsin Dells. Fortunately we soon left the crowds behind and a perilous stretch of mountain road brought us to tiny Faralya, untouched by development and contrasting starkly with Fethiye. In Faralya we stayed at George House, a hidden little gem with some of Turkey’s best hiking at its doorstep. 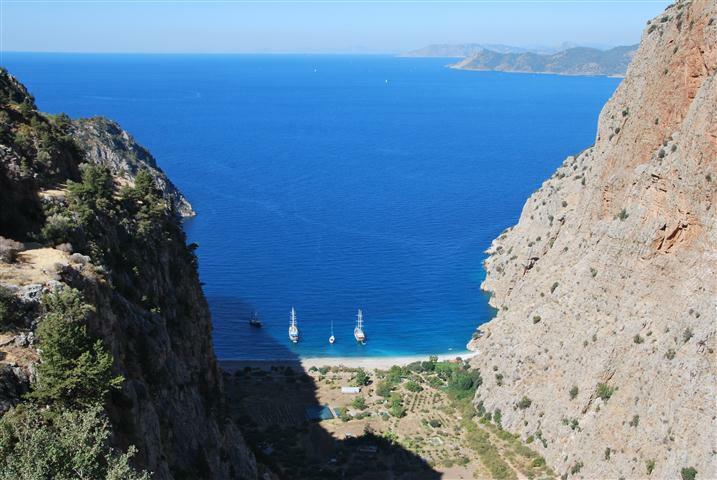 Its close proximity to the Lycian Way means that it’s more likely to be frequented by nature lovers and hikers than people looking to party. The rooms and amenities at George’s are nice but its real appeal is its location on a cliff overlooking the Mediterranean Sea. Our stay here marked the beginning of one of the most relaxing weeks of our entire trip. During the day we hiked, swam and finally had a chance to read some of the books we had been lugging around for months. Each night we ate a home cooked Turkish meal prepared by George’s daughters, drank tall cans of Efes beer dispensed on the honor system and swapped stories with other travelers. 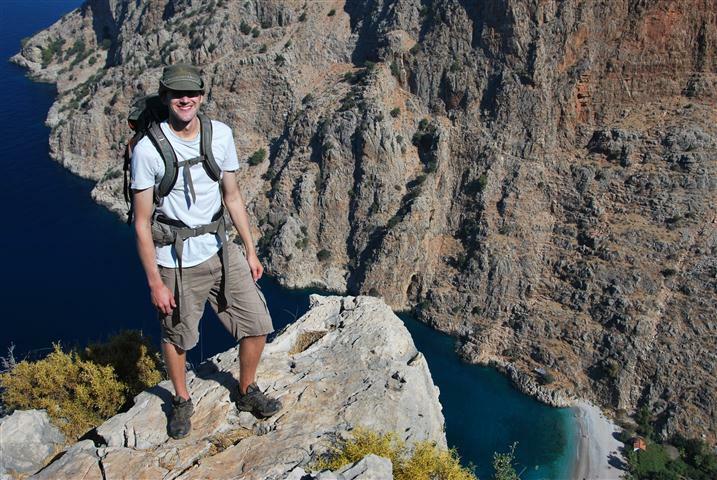 The tranquility of our stay was interrupted only by a death defying hike to the beach in nearby Butterfly Valley. 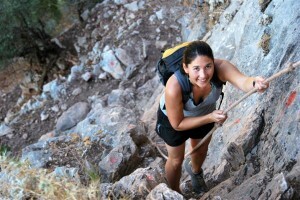 The trail was so steep that several stretches are outfitted with ropes to aid in the descent. After a little more than an hour the trail leveled out and the valley opened up before us. During our descent we’d watched a small armada of tour boats ominously approach, but fortunately they soon departed and we had the beach to ourselves. We enjoyed our stay at George’s so much that it was tempting to hang around for a few more days. 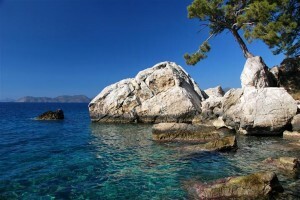 However, other travelers encouraged us to make our way to remote Kabak with promises that we wouldn’t be disappointed. Rather than waiting for an infrequent minibus, we packed the essentials and set off on foot. 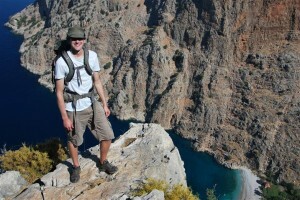 An initial ascent brought spectacular views of brilliant blue water and Butterfly Valley below. Further along the coast we came upon hundreds of beehives and a beekeeper offering tea, cookies and a chance to try on his bee suit. As he dusted off an old crate for use as a table we thumbed through the language section of our guidebook looking for conversation starters in Turkish. We quickly exhausted the few appropriate options and once we were left with phrases like “I am allergic to…” we passed the time with smiles and nods. 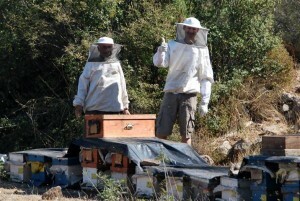 After finishing our two cups of tea we were surprised that he neither asked for nor would he accept any compensation, and he even sent us on our way with a frame full of honey. Two hours of hiking and a few wrong turns later, we stopped for lunch at a picture perfect spot along the coast. After a swim in the clear Mediterranean water we hiked the final stretch to Kabak, where we stayed at the Olive Garden for three tranquil nights. Each night we looked out at the Mediterranean and dined on a delicious multicourse meal prepared by the owner, a former chef. Breakfast was typical Turkish fare but perfectly presented and with extras like yogurt and fresh fruit. Our stay in Kabak passed too quickly as we enjoyed challenging hikes and a nearly empty beach. It was so pleasant that reality may have completely slipped away from us if I hadn’t spent several hours crouched over the laptop, interviewing for jobs via Skype. When it finally came time to fly to Egypt, we weren’t ready to leave. Having heard so many wonderful things about Turkey, we thought we’d enjoy our stay but the country more than exceeded our expectations. Friendly locals, stunning natural beauty, delicious cuisine and a fascinating history make Turkey one of our favorite countries and, without a doubt, one that we will visit again. 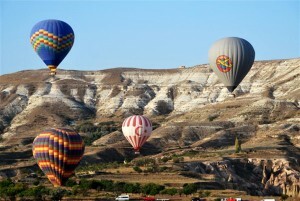 Most people who have traveled to Turkey will inevitably advise you to visit Cappadocia during your stay. Famous for its lunar landscape of limestone rock formations, commonly known as fairy chimneys, we decided to see what all the fuss was about as we headed south to Turkey’s Mediterranean coast. Eight hours after leaving Safranbolu, we arrived in Goreme, a small village in the center of Cappadocia. Goreme’s hotels have done their best to capitalize on the region’s unique geology by carving rooms into the rocky pinnacles and giving themselves names like Flintstones Cave Hotel. Initially excited to experience cave dwelling first-hand, after four nights of sleeping in dark rooms we concluded that residing in a cave isn’t quite as cool as it sounds. Of course our negative opinion may subconsciously be attributed to the bed bugs we found during our first night in Goreme. Fortunately, we were able to switch rooms after discovering the telltale black spots indicative of a bed bug infestation. Yuck. The town of Goreme is an deal place if you’re looking to purchase an expensive rug or want to spend time sipping Turkish tea. For avid hikers, however, the real attractions are just outside the city in Goreme National Park. Filled with picturesque valleys, one could spend days exploring the rocky landscape. We only had one full day to hike but made the most of our limited time. Similar to national parks in the United States, the more challenging trails further afield are deserted so after a short walk we had the park to ourselves. At first glance, the park is reminiscent of Bryce Canyon National Park in southern Utah. 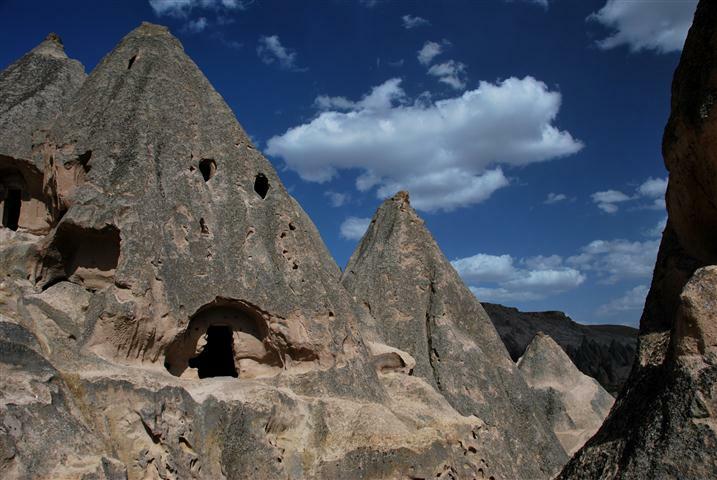 Valleys filled with fairy chimneys dot the landscape of both but in Goreme National Park, rock-cut churches and pigeon houses are also scattered across the landscape. 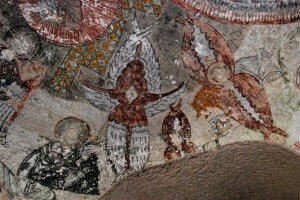 Although the churches have not been used for hundreds of years, the remains of detailed frescoes can still be seen on the walls and ceiling. It’s not possible to venture into the pigeon houses but we could see them peppering cliffs and fairy chimneys as we walked. These rooms were traditionally used to house pigeons so their droppings could be collected for fertilizer. We didn’t want to rent a car in Goreme, so we signed up for a day tour to see some sights inaccessible by public transportation. Most of the places we visited during our tour were overcrowded with groups and thus detracted from the experience but our guide was knowledgeable and did an admirable job managing our massive group of nearly 40 people. 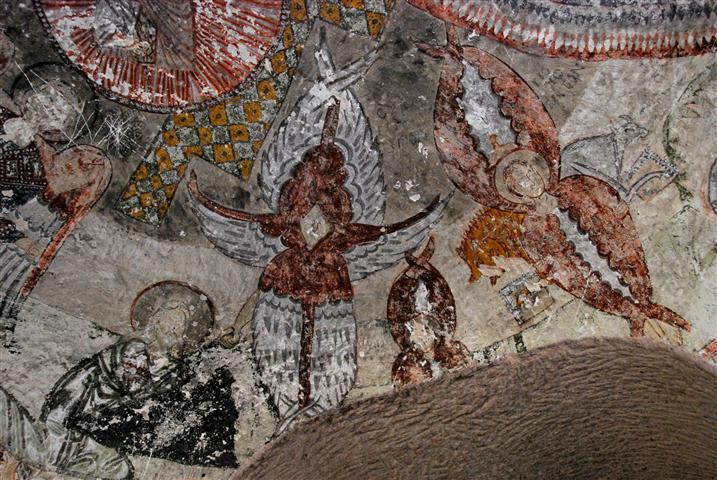 One of our favorite stops on the tour was a vast underground city used by Christians hiding from Persian and Arabic invaders during the sixth and seventh centuries. Apparently nearly 150 of theses cities exist in the region but many have not been excavated. We visited one of the biggest, once home to 10,000 people. Traveling seven levels down through claustrophobic passages, I found it difficult to comprehend that residents sometimes spent months at a time underground. During our one and a half hour journey into the depths, we saw old churches, kitchens with ovens, stables and a morgue. 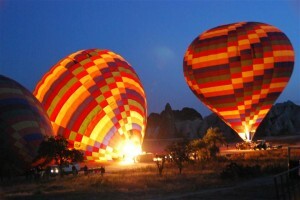 Cappadocia is reputed to be one of the world’s best places to take a flight in a hot air balloon. Feeling like this was as good a time as any to give it a try, we splurged on our anniversary and signed up for a sunrise flight. 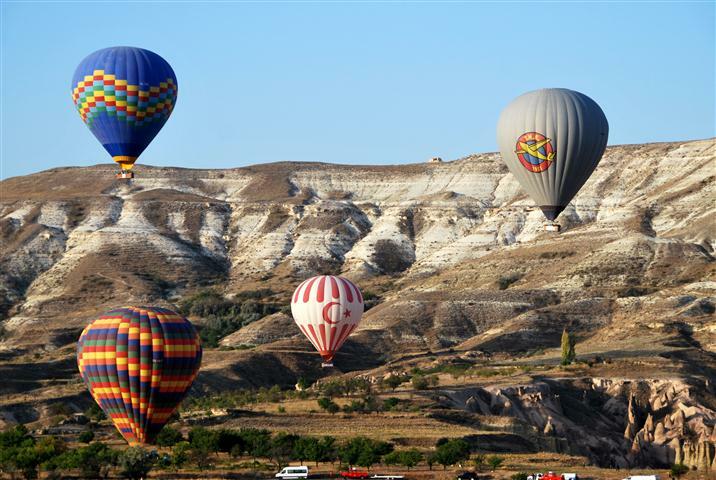 Floating above Cappadocia while crammed into a basket with 20 other tourists was not exactly romantic but it still felt like a special way to celebrate two years of wedded bliss. After a champagne toast, we headed back into town to check out of our grungy hotel and into the fanciest digs of our entire trip. We felt very spoiled as we settled into our large room outfitted with a king size bed, hot tub and shower with 16 showerheads. We spent a total of four nights in Goreme. The hiking was incredible and the hot air balloon ride was a definite highlight but we generally weren’t as impressed with Cappadocia as other travelers. We’ve seen similar landscapes in the United States and we seem to have developed a particular aversion to very touristy places. 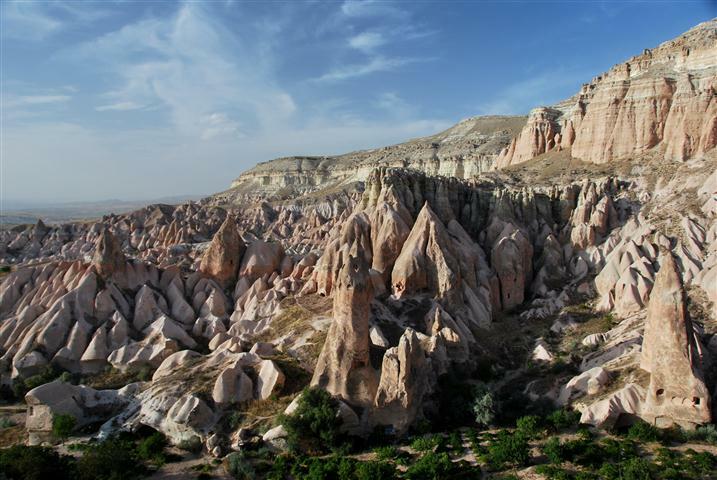 Fortunately Cappadocia was a natural stopping point between Safranbolu and the Mediterranean coast, which turned out to be one of our favorite destinations of the entire trip. Regardless of how much we enjoyed our time in Istanbul, we were excited to move on. Prices in Turkey’s capital are higher than the rest of the country and we were curious to see how people live outside the city. Hoping for a respite from the large tour groups dominating Istanbul’s popular sites, we reserved a room in Safranbolu, seven hours east of Istanbul and more likely to be frequented by Turkish tourists than foreigners. Nestled along a picturesque canyon and filled with the country’s best preserved Ottoman architecture, Safranbolu seemed like a comfortable place to kick back for a few days. Bus travel in Turkey is reputed to be efficient, affordable and comfortable but six months of miserable bus rides had left us feeling cynical. 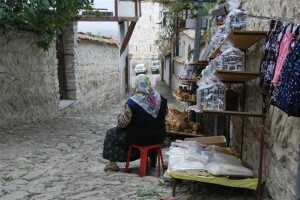 Expectations low, we waited for the bus to Safranbolu while enjoying our lunch of fruit and freshly baked bread. The bus pulled up right on time and we were thrilled to discover a modern bus with spotless interior, designated seats for each passenger and no one standing in the aisle. As the bus got going, we were overjoyed to find that it only made regularly scheduled stops rather than slowing down every five minutes to pick up passengers on the side of the road. The biggest shocker of all may have been the cleanliness of the bathrooms when we stopped for a break. We hadn’t seen bathrooms this clean since we left Japan! Normally after traveling by bus, we arrive at our destination feeling tired, cranky, dirty and sweaty but after seven hours of traveling on Turkey’s smooth roads, we arrived in Safranbolu feeling rested and content. Safranbolu’s primary attraction is the old town and we spent much of our time simply wandering through the area’s narrow cobblestone streets. Filled with historic Ottoman wooden houses, many of which have been beautifully preserved, it was easy to envision the way Turkey may have once looked. September is the start of Safranbolu’s low season so it almost felt like we had the place to ourselves as we passed by countless sweet shops selling Turkish delight and small stores filled with locally made handicrafts. As we browsed through a blacksmith’s shop overflowing with unique metalwork, he seemed just as concerned with offering us tea and showing us pictures as he did with making a sale. 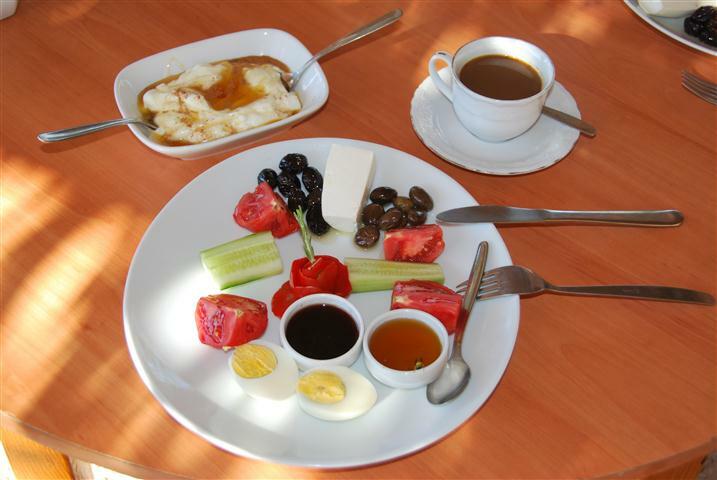 This was one of our first encounters with Turkish hospitality and as we traveled throughout the country, we realized that situations like this are exceedingly common. We woke to picture perfect blue skies on our last full day in Safranbolu. Eager to take advantage of the weather and curious to see the surrounding countryside, we filled our daypacks with the essentials and set off on foot from our hotel. 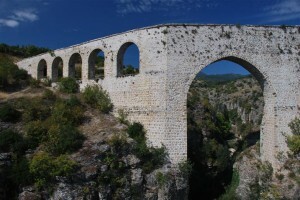 Our final destination was Incekaya Aqueduct, about four miles from the city. We hoped to follow the gorge but never found a path so ended up walking through town instead. 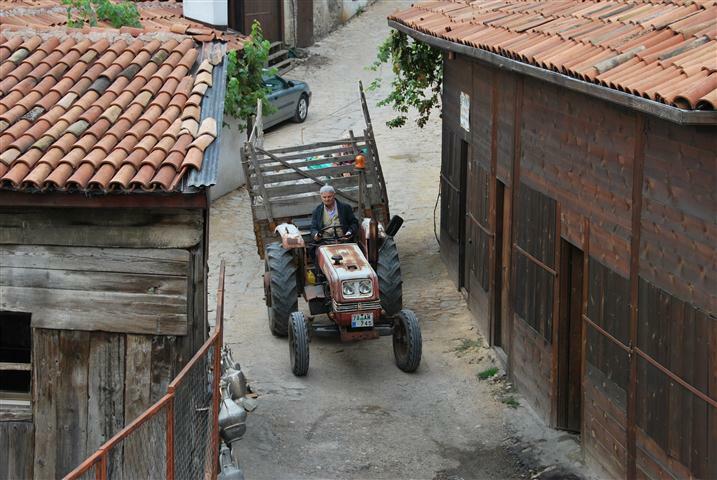 This was a blessing in disguise as it gave us the opportunity to see Safranbolu’s less touristy areas and interact with people along the way. We continued to be amazed by the friendliness and generosity of the Turks we met; everything from buying a bottle of water to glancing at our map resulted in friendly banter. At one point, an older man greeted us on the street and invited us to join him for tea. Stepping into a shaded courtyard filled with men smoking, drinking tea and playing Tavla we were greeted by a few curious stares but no one seemed to mind that we obviously weren’t regulars. Our companion did not speak English so we sipped our tea and communicated through hand gestures and smiles before he graciously paid the bill and we went our separate ways. 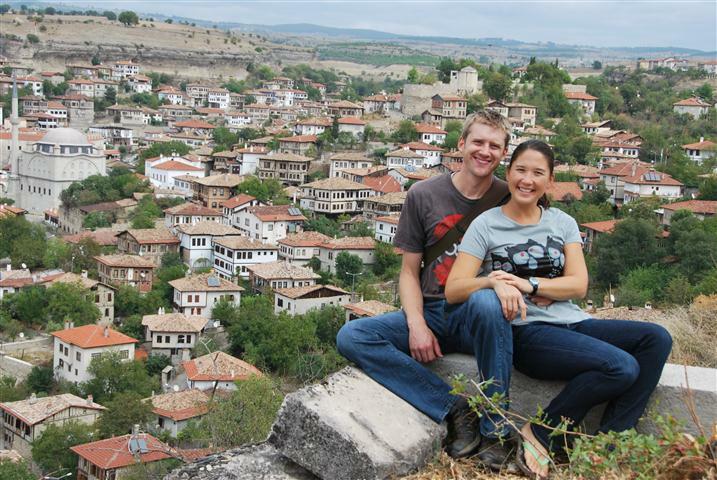 After reaching the outskirts of Safranbolu, we walked through a couple of tiny villages but never saw any signs pointing us in the direction of the aqueduct. Just as we began to doubt its existence, we rounded a corner and saw its arches looming high above the canyon walls. 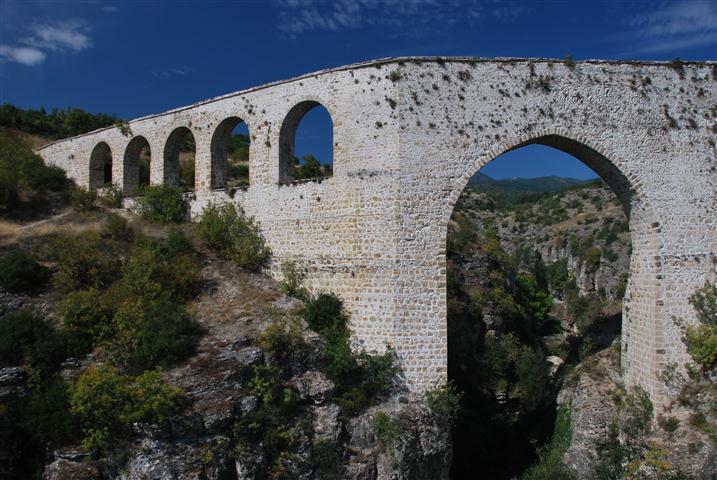 An impressive 116 meters long, Incekaya Aqueduct was once used to bring water to the area’s residents. Although it hasn’t been used for hundreds of years, it was restored in the 1790s and has retained its beauty. Having worked up an appetite, we found a spot in the shade and settled in for another lunch of fruit and freshly baked bread topped with peanut butter. Stomachs full, we crossed the gorge atop the narrow walls of the aqueduct and spent some time exploring the area. After taking photos and relishing the peacefulness of our secluded spot, we reluctantly headed back to Safranbolu.